Initially most experts wrote off Tumblr based on the fact that its numbers did not seem as astronomically impactful as the ones posted by biggies like Facebook and Twitter. But over the years it has grown to become a major player in the social space by pioneering “microblogging.” 50 million highly active users is no mean feat and even if smaller than the big brothers of the trade, it is a significant number for the marketers to consider, especially for those who believe in content marketing. The primary reason why Tumblr is important is not because it has a lot of users. It’s important because by its very nature, it has built a culture that is more quality-oriented. It is a place where genuine content is appreciated and shared more than silly memes and frivolous pieces of self-obsessive content. Research suggests that average Tumblr users spend more time per visit on the site compared to the average Facebook users. It has a strong community that appreciates good content and subtly admonishes shallow engagement for the sake of it. In fact, Tumblr and other microblogging sites have even been taken seriously to the point of severity in the past. Tumblr also places itself in a different league by remaining completely democratic. Other networks are somewhat becoming exclusivist as people are becoming more and more concerned about their privacy, but thus beating the whole purpose of social networks. Tumblr resists such temptations mostly. You can show your appreciation with the “love” button or help it go viral with the “reblog” button. Due to its delectable layout, it is more visual than Twitter and due to its unique culture it is more serious and eclectic than Facebook. With its sophisticated features and content orientation, Tumblr can be a valuable tool for content marketers. It also offers effective synchronisation with other networks including FB, Twitter, Blogger as well as WordPress. The site keeps most of its content open to search engine crawlers and it can be easily integrated with Google Analytics too. So, you can use it to drive both direct and indirect traffic to your main website. You can post your updates here or use it as a secondary blog for your company too. You can post links, videos and images in the same manner as Facebook, but what helps here is the visual appeal and more attentive audience base that actually take time out of their busy day to see what you are posting. Among other new functionalities, it has also added a new system of paid ads and the ability to blog via mobile in order to make it even more accessible. 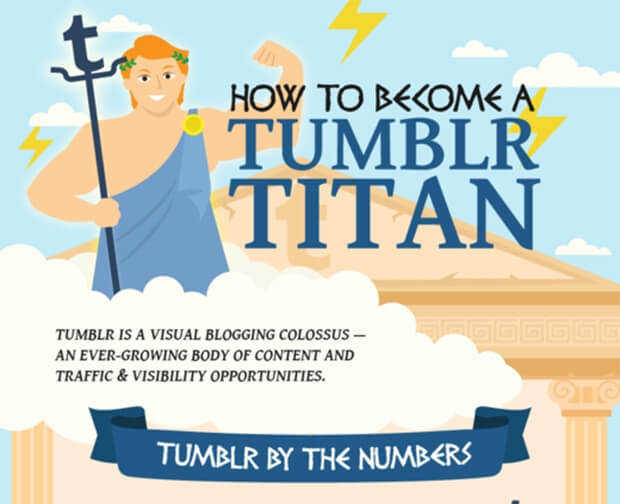 Many different strategies can be used to make the most of Tumblr. But it is better to have a clear plan to derive the optimum benefit from it. It is also important to understand what it can do for you and what it cannot. Keeping these things in mind, we have created the following infographic for you. Follow it to plan and implement your Tumblr strategies and achieve out of the world traffic and engagement.